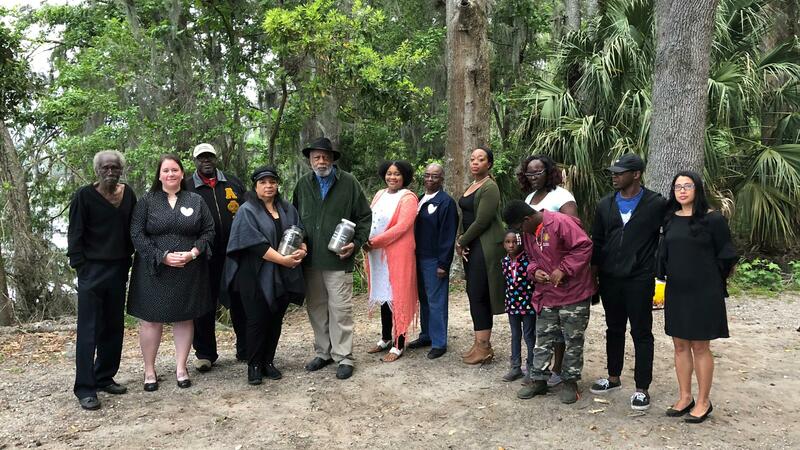 Eloquent column by by Regina Gayle Phillips, Vice Chair of the St. Augustine Confederate Memorial Contextualization Advisory Committee, on the scourge of lynching snd slavery in our town and Nation. We need to promote healing and understanding, two of the admirable aims of the Lincolnville Museum, which Ms. Phillips and her husband are saving, preserving and protecting in the building that once housed segregated Jim Crow Excelsior School. A group of community activists gather for a prayer service and soil collection in April at the site believed to be where Isaac Barrett was hanged. I never knew it would be so emotional, but I found myself crying for the memory of a man I never met or knew. Isaac Barrett was lynched in Orangedale by the St. Johns River in June 1897, which was 59 years before I was born. I only learned of him in the last year, but when I saw his memorial hanging over a water wall at the National Memorial of Peace and Justice in Montgomery, Alabama, this weekend, I lost it and could not hold back the tears. It could have been my grandparents who made their home on the St. Johns and are buried just a few miles north of where the Barrett lynching took place. The sound of the flowing water was sobering. We walked through rows and rows of hanging sculptures representing more than 4,000 blacks who lost their lives through acts of terror and public shaming without the due process of a trial of law. Mobs had taken this man from the arms of law enforcement and strung him up on a tree by the river bank. No trial, no judge, no jury of his peers ever got a chance to hear his case, let alone pass judgement on his fate. A hooded mob stole him away and became his executioners. We don’t know if he was guilty or innocent, only accused during a time when the word of a black man was worthless over that of any white person and no quest for truth was necessary. Isaac Barrett told the sheriff he came to the rescue of the Hewson family, who were victims of a brutal, bloody beating, according to news reports from the time. He had worked for the family and lived on their property just two miles from the river. A report reads that when he heard the distress call he ran to them to aid. When the sheriff arrived, the bloodied wife and daughter gave an account of being attacked just moments earlier. The family, mother, father, daughter and son were covered with blood; Barrett was not. The sheriff said Barrett later admitted to the crime and signed a confession to the same. He was “hog tied” and being transported to the jail when the mob of hooded men stole him away from the buckboard wagon the sheriff was transporting him on and took him directly to the river and hanged him from a tree. The story of Barrett’s lynching was retold in the New York Times, perhaps by a reporter who happened by on a riverboat or steamer headed south on the St. Johns or perhaps sent to them by someone local who wanted someone to know the injustice that had occurred. It was a time in American history when lynching in public places was very prevalent. Lynchings were used as a form of intimidation and fear, according to Brian Stevens, director of the non-profit Equal Justice Initiative. The nonprofit has collected stories and created the memorial and the Legacy Museum to remember the live of Americans taken by terroristic mob action during a period of Jim Crow laws and lawless disregard for human life of anyone with dark pigmentation in their skin and those who sympathized with them. Many were hanged. Some were shot, burned, mutilated or dismembered in public settings. On many occasions the lynchings included public announcements and gathering in a picnic or carnival-like setting. There is no evidence this was the case with Isaac Barrett. We have not found any record of family who mourned him or where he is buried. Only the account of how he died. For that we are deeply sorrowful. Trish Becker and Mary Cobb have worked tirelessly to help us to find additional information on the Barrett family as well as the Hewson family, both victims of violence. We have not ignored the story of the Hewson Family and the horror they experienced; we acknowledge their pain. We also know due process was superseded by mob rule, and a human being was left dangling from a tree. Our object here is not to be gruesome but to show the injustice of death by lynching. Barrett’s is but one of more than 4,000 lynching identified by EJI as they prepared to create the monument and museum. Only one was positively identified in St. Johns County between the years of 1866 and 1950, when they tapered off. As a national movement towards reconciliation through acknowledgement of these horrendous killings, EJI is offering counties the opportunities to claim a duplicate monument for localities where lynching took place. We collected two jars of soil and carried one them to the Legacy Museum this weekend. The other will be on display at the Lincolnville Museum and Cultural Center. We have applied for a marker in the location of his death. We will ask the county to request the duplicate memorial or we will accept that also. We live in a community where history surrounds us at every turn, but history must be presented without filter or aggrandizement. Visiting the seat of the Confederacy last week with all its monuments and markers showed me that we too can present all history and be embraced for telling our truth. Montgomery was also at the heart of the civil rights movement and the largest slave region in the country. Dr. King started out there, the Montgomery bus boycott thrust him into the nation’s gaze. If they can tell stories that are raw and bring us to a point of grief and brokenness that lead to healing and hope, then St. Johns County and St. Augustine should also be able to tell our stories knowing that only the truth will set us free, a truth that is not always pretty, happy or prideful. Our history is littered with injustices since the first recordings of life here, beginning with displacement of Native Americans. Every ethnic group can claim some form of discrimination here. This should make us all more sympathetic and forgiving. Facing the ills of the past and building on past ills to create a healthier tomorrow. Not ignoring or sugar coating the truth, but facing it head on and working through the hard places in history to create a community where true compassion is not a window dressing or fancy garnish. A monument to a man unknown to most historians and residents in St. Augustine is one way to see what we did, meditate on the injustice of it and hope for the new bonds it will foster. Seeing people in Montgomery from all ethnic and economic backgrounds come together to celebrate the opening of a museum to the legacy of slavery was truly heartwarming. When I cried, I embraced and was embraced by women of European, African, Asian, and Mediterranean decent. We all mourned together and rejoiced together to be a part of something so profound, so humbling, so emotional, so healing. I am just selfish enough to want the same for my city.